Not enough space on your computer desk? Here’s a 19-inch monitor with an entire PC built into it, courtesy of ViewSonic. The VPC100 is the company’s first all-in-one PC venture in India, and it looks mighty promising indeed. Its 18.5-inch screen has a native resolution of 1,366x768 pixels, contrast ratio of 1000:1, response time of 5ms and a 160-degree viewing angle. Running on Windows XP, the device is powered by a 1.6GHz Intel Atom N270 processor and comes equipped with 1GB DDR2 RAM, 160GB hard disk, 8x DVD writer, Gigabit Ethernet and Wi-Fi. For connecting external devices, there are the standard PS/2 ports for a keyboard and a mouse, standard 3.5mm ports for headphones and microphone, four additional USB ports and a 4-in-1 card memory reader too. Of course, you probably won’t need the headphone and microphone slots anyway, considering that the VPC100 packs in dual 3-watt speakers as well as a built-in mike. Coupled with the 1.3-megapixel Webcam, this is ideal for some video chats! At a thickness of 35mm, the device is quite slim for an all-in-one PC, and tips the weight scales at just 5.32kgs. 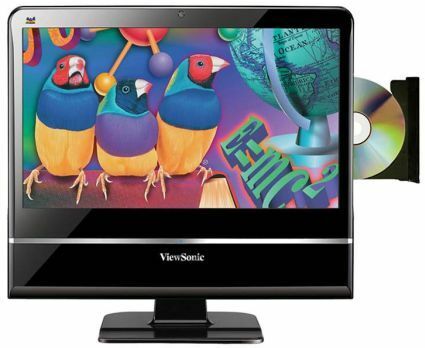 ViewSonic has thrown in some software with the bundle – including Winrar, an antivirus and a DVD burning solution – and priced it at Rs 31,999. The price is a bit steep, if you ask us, because you could just as easily buy an a 19-inch monitor, an external DVD writer and an Asus EEE Box PC with similar specs for a few thousand less. But then you wouldn’t be able to tout the ‘all-in-one’ tag now, would you?